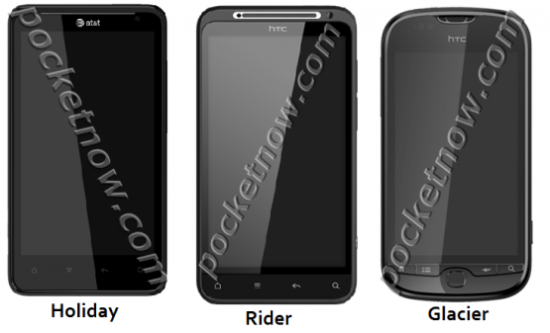 Some brand new renders have come up showing 3 new handsets that are most likely planned to be released soon. The phones are called the HTC Holiday, HTC Rider and HTC Glacier. A blurry cam shot emerged last week along with a ROM image, which promises a dual-core 1.2GHz CPU, 1GB RAM, and a 4.3-inch qHD display for the HTC Rider. Sadly we have no more info on this right now.